No matter what type of guinea pig habitat you choose, a single guinea pig needs a cage with at least four square feet of living space. While no cage is perfect, the following enclosures are recommended based on their design/durability, the amount of security they provide, and how easily they can be cleaned. 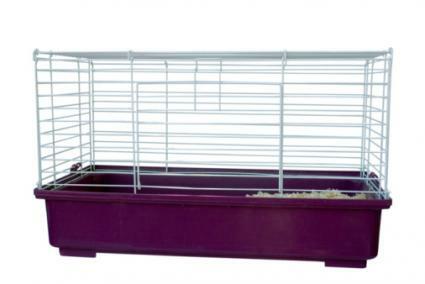 This Ware cage (pictured right) features steel construction so guinea pigs, also know as cavies, can't chew through their habitat. The front door has a spring lock to prevent an escape. The cage measures 30" L x 17.5" W x 25.75" H, and the litter tray is deeper than most commercial cages, which will help keep your pet's bedding inside the cage instead of on the surrounding floor. In addition to the main floor space, there's a ramp that leads to an upper deck that would be an ideal place to locate your pet's feeding station. 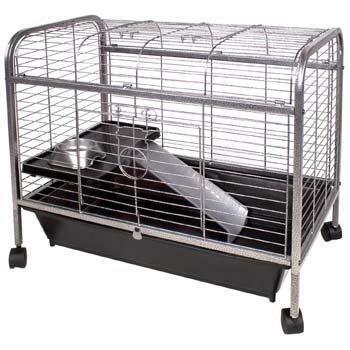 On the downside, this cage comes with a floor grate that would be uncomfortable for your pet's feet, but that problem is easily remedied; just don't install it when you put the cage together. This cage is relatively easy to clean once you remove your pet. The litter tray slides out from the main unit so you can dump the soiled bedding and wipe the tray clean. The top of the cage is hinged and folds open for complete access to everything inside. The entire set up is housed in a tubular steel frame with wheels, so you can roll it out of the way to sweep underneath, put it back, and lock the casters so the cage remains in place. The cage retails around $100.00, depending on where you purchase it. The quality of the material and design should allow you to continue using the cage for many years, so you'll get good value for the price. The Prevue Hendryx Jumbo Small Animal Cage cage is similar in design to the Ware cage, with a few differences. This cage measures 21.5" L x 32" W x 33.5" H, not including the height of the tubular steel stand, so it offers considerably more space. The upper portion of the cage is made with powder-coated wire, while the bottom pan is made from heavy-duty plastic. The cage comes with a grill floor, which is suitable if you want to house a rabbit, but the company recommends leaving the grill out for guinea pigs since their feet are more sensitive. Without the grill, the sides of the pan work like urine guards to keep male guinea pigs from squirting outside of the cage. After removing your pet, the entire cage top can be removed from the pan to collect the soiled bedding by using a shop vacuum before wiping the interior down. You can also slide the bottom pan out of the unit and dump the soiled bedding into a trash bag if you prefer. The cost of this cage typically runs about $110.00. However, the site occasionally runs sales. Woody's cavy/guinea pig cage doesn't offer any frills, but its galvanized wire construction is very sturdy. The cage comes with a heavy-duty plastic pan, and you can purchase a replacement pan if you ever need to. 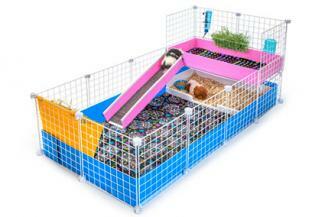 The cage measures 30" L x 24" W x 12" H. This provides just enough floor space for a single pet. The entire front of the cage opens, so you'll need a safe place to keep your pet while you're cleaning. Just pull the pan out to empty the dirty bedding, and wipe down the pan, as well as the interior cage wires. The cost of this cage is fairly economical at $55.00. Whether you're looking for less expensive housing or you prefer a much larger habitat than the average commercial cage provides, the following options offer some alternatives. If you want to create a much larger habitat for your pet, you might consider building a cage using corrugated plastic and metal storage cube kits, also known as a Coro and Cube cage. This type of cage was pioneered by Teresa Murphy, of Cavy Spirit.com Guinea Pig Rescue, but you can now buy kits to build various models. To make one of these cages, a sheet of corrugated plastic is measured, cut in some places, and scored and folded in other areas to create the liner for the cage. The liner is then framed by connecting the wire panels from a do-it-yourself storage cube kit found in the home department at any department store like Meijers, Walmart or Target. The major drawback to this type of cage is that there is no lid for added security. This might not be a good habitat if you also have cats and/or dogs. If you don't have other pets that could potentially harm your guinea pig, you can convert a large plastic storage tub into a reasonably suitable habitat. 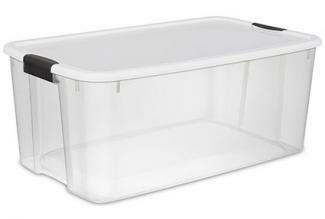 The Sterilite Ultra storage box is one of the larger tubs available, and it measures 33 1/8" L x 20 1/4" W x 14 3/4" H. Line it with recycled newspaper bedding, add food and water bowls, and place the tub in an area away from drafts and direct sunlight. Many guinea pig breeders use this kind of setup, and they keep a clean tub ready to transfer their animals into in order to disturb them as little as possible. Be sure you don't close your pet in the solid plastic lid that comes with the tub. You can use window screens from a hardware shop as lids that allow for fresh air flow. The following tips will keep as much floor space available for your pet as possible, and his food and water will be cleaner, too. A hanging water bottle can be a real space saver. Just attach it to the outside of your pet's cage with only the drinking tube sticking through the bars. This type of bottle is much more hygienic, so you'll never have to worry about your pet fouling his water or soaking his cage by tipping his bowl over. A bin feeder attaches to the side of the cage, and more food drops from the top of the bin as your pet eats from the dish below. This type of feeder typically takes up half as much floor space as a crock. A hay rack will keep your pet's timothy hay clean and dry. Attach the rack to the cage bars, and fill it with hay. Your pet will pull strands out to munch on whenever he pleases. Your guinea pig will spend the majority of its life in whatever cage you choose, so try to purchase the very best cage you can afford. Think of the cost as an investment in your pet's well being and remember that a well-built cage is going to last far longer than the average cheap cage on the market.